Published: Feb 10, 1996 to ? Ryu was warned of the dangers of the Dark Hadou, a foul energy that can overwelm a warrior and turn them into a heartless killing machine. But, Ryu's desire for fighting perfection seems to be drawing him down the path to the Dark Hadou and ultimately climax into a battle with a man named M. Bison. But Ryu has his best friend Ken and Rookie Interpol officer Chun-Li to see he his soul doesn't become corrupted forever. 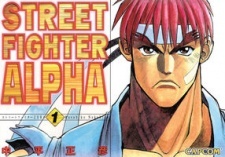 Street Fighter Alpha was published in English by Udon Entertainment from June 5 to August 21, 2007.